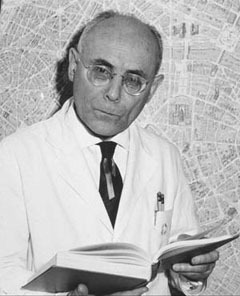 French-American physician and physiologist André F. Cournand studied circulation of the blood, and advanced understanding and treatment for heart disease. He won the Nobel Prize in 1956, shared with his colleague Dickinson W. Richards and the German country doctor Werner Forssmann, for cardiac catheterization, in which a catheter is inserted through a vein into the heart. Cournand published about 100 papers on the cardiopulmonary system, and established better methods to measure cardiac output and blood pressure in the right heart and the pulmonary artery. He edited The American Journal of Physiology, became an American citizen in 1941, and served on the Chemical Warfare Service in World War II.